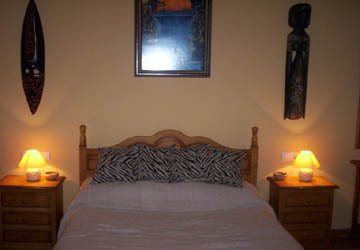 Hotel Casa Bob is a small friendly guesthouse in the quiet Spanish village of Cuevas de San Marcos, Málaga. It is equidistant from Málaga city, Málaga-Costa del Sol and Granada Airports (ca 1 hour). It is a fully-licensed pension so, of course, is fitted with all of the emergency lighting, fire extinguishers, an intercom for the front door on all floors, telephone and tv points on all floors. For health reasons and no other, the owners are reluctantly putting the property on the market with immediate effect. The target price is only 250,000 euros for a quick sale. The owners would even consider a part-exchange for a smaller property on the Costa del Sol. I trust the owners implicitly – you can either make direct contact or use the form below and I will progress. Some of the bedrooms offer en suite facilities others offer shared bathrooms. There are even a couple of family rooms so you do not have to be separated from the children. In total it has 8 bedrooms, 2 of which are en-suite, a very large fully fitted kitchen, an office, a lounge/diner/bar, a second lounge/bar, two terraces one of which has a hot tub which is brilliant to relax in on both hot and cooler days. There are two further bathrooms. As mentioned above, it is a fully-licensed property and is NOT just another villa that the owners are trying to fund with holiday lets. It is a working guesthouse with all paperwork in place. The new owners could, of course, simply use it as a delightful and spacious family home. The town is very Spanish with many little squares to relax and bars and restaurants to while away the day in. However the town is only 1 hour’s drive from Málaga and Granada Airports and resorts such as Torremolinos. It is also just one hour’s drive to the skiing resort of the Sierra Nevada. The large towns of Antequera and Lucena are only 20 minutes’ drive away, and have large hypermarkets for shopping. Antequera boasts the nearest golf course. The Iznájar Dam is certainly the most prominent landmark in the area. Most of the reservoir itself is in the Córdoba province but the dam itself is quite close to the town of Cuevas De San Marcos. Many townspeople come here on weekends to swim and picnic in the beautiful fresh water landscape. It is a popular spot with local fishermen as well. For serving members, families and ex-members of the Armed Forces, Bob and Nina have always offered a 25% discount on the price of accommodation at the hotel.